Abell 2163 is one of the richest Abell clusters and has been extensively studied since it was identified as an exceptionally hot cluster of galaxies (15 keV; Arnaud et al. 1992). Many X-ray studies have found evidence that the cluster has a non-isothermal gas distribution with strong temperature variations in the center of the cluster (Markevitch et al. 1994; Markevitch 1996; Markevitch & Vikhlinin 2001; Govoni et al. 2004; and Ota et al. 2014). Feretti et al. (2001) were the first to identify a radio halo centered on the cluster and a potential radio relic ~2.2 Mpc to the northeast of the cluster center. Feretti et al. (2004) followed up the initial radio observations and measured the spectral index associated with the radio emission. Note that the hottest part of the X-ray emission (18 keV, Bourdin et al. 2011; Ota et al. 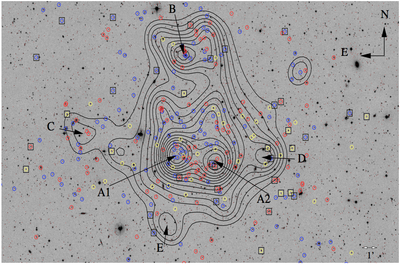 2014) is correlated with the location of the radio relic in the northeast of the main cluster. Many of the aforementioned X-ray studies (and Raphaeli et al. 2006) have attempted to measure a non-thermal component due to inverse Compton scattering of CMB photons by the relativistic population of particles suspected to be associated with the diffuse radio emission, but no conclusive evidence of non-thermal emission has been observed yet. 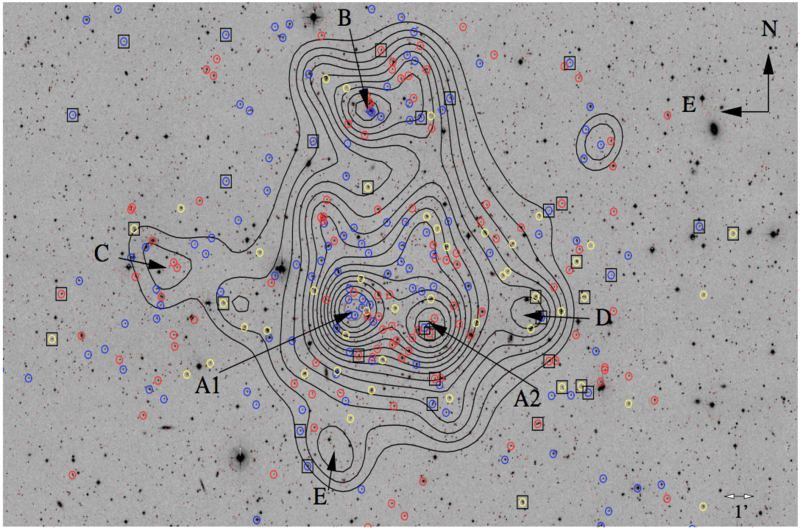 A number of weak lensing analyses of the cluster have been carried out (e.g. Squires et al. 1997, Radovich et al. 2008, Okabe et al. 2011, Soucail 2012). Okabe et al. (2011) and Soucail (2012) both find evidence for a bimodal mass distribution with the peak of the X-ray gas located between the two mass peaks. Additionally Soucail (2012) identifies a mass peak ~6' (~1.2 Mpc) to the north of the main cluster, which corresponds to substructure A2163-B identified in a spectroscopic survey of the area by Maurogordato et al. (2008). They argue that this structure will eventually merger with the main subcluster. Soucail (2012) estimate that the main cluster is composed of a 7.1 and 2.5 x10^14 Msun subcluster that have undergone their first pass through and that the infalling A2163-B has a mass of ~2.7x10^14 Msun. There is some discrepancy between the Okabe et al. (2011) mass estimates that suggest a 8:1 to 10:1 mass ratio of the merging subclusters in the main cluster and a total mass for the system that is about 50% larger than the Soucail (2011) estimate. Bourdin et al. (2011) estimate a 1:4 mass ratio between the A2163-A subcluster components and conduct a timing-argument dynamics analysis which they suggest implies that the A2163-A subclusters collied ~0.1-1.0 Gyr ago. Based on Govoni et al. (2004) X-ray and radio image, and Soucail (2011) mass map. Arnaud, M. et al., 1992. A2163 - an exceptionally hot cluster of galaxies. Astrophysical Journal, 390, pp.345–349. Wilbanks, T.M. et al., 1994. Measurement of the Sunyaev-Zel'dovich effect toward Abell 2163 at a wavelength of 2.2 millimeters. Astrophysical Journal, 427, pp.L75–L78. Markevitch, M. et al., 1994. 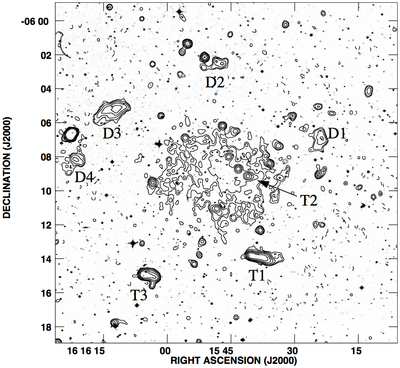 Nonisothermality of the hottest cluster Abell 2163. Astrophysical Journal, 436, pp.L71–L74. Elbaz, D., Arnaud, M. & Boehringer, H., 1995. 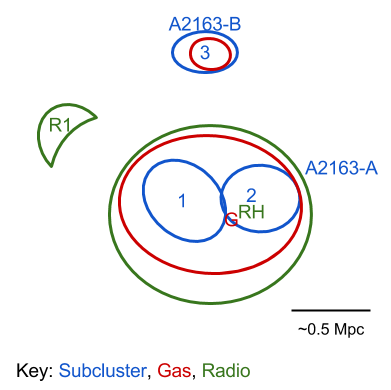 The gas distribution and binding mass in the A 2163 cluster. Astronomy and Astrophysics, 293, pp.337–346. Markevitch, M. et al., 1996. Abell 2163: Temperature, Mass, and Hydrostatic Equilibrium. Astrophysical Journal, 456, p.437. Squires, G. et al., 1997. 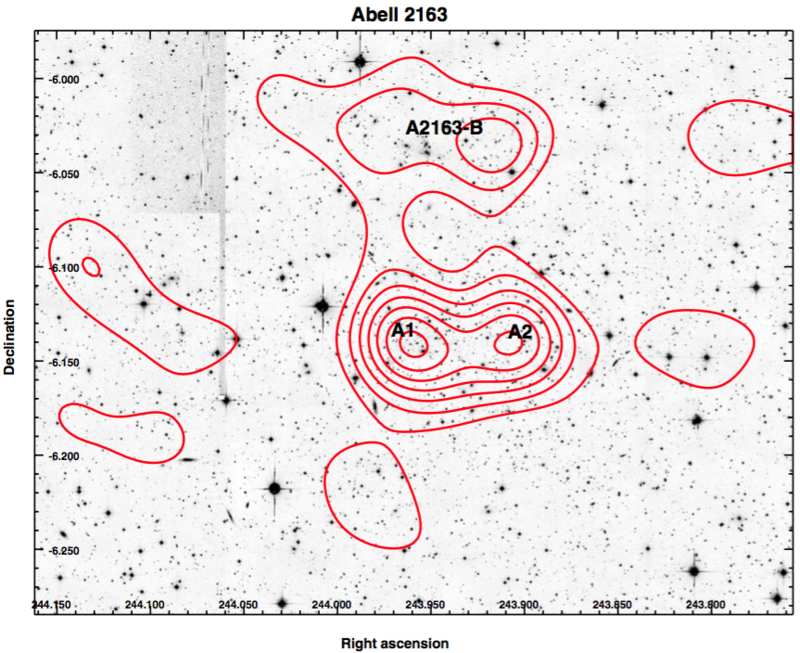 Weak Gravitational Lensing and X-Ray Analysis of Abell 2163. Astrophysical Journal, 482, pp.648–658. Feretti, L. et al., 2001. The giant radio halo in Abell 2163. Astronomy and Astrophysics, 373(1), pp.106–112. Markevitch, M. & Vikhlinin, A., 2001. 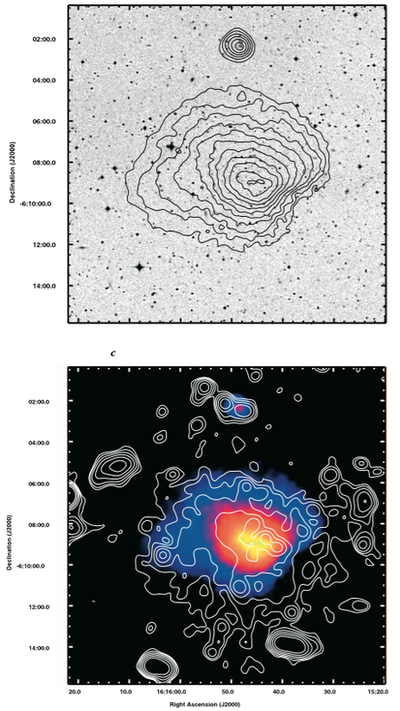 Merger Shocks in Galaxy Clusters A665 and A2163 and Their Relation to Radio Halos. Astrophysical Journal, 563(1), pp.95–102. Govoni, F. et al., 2004. 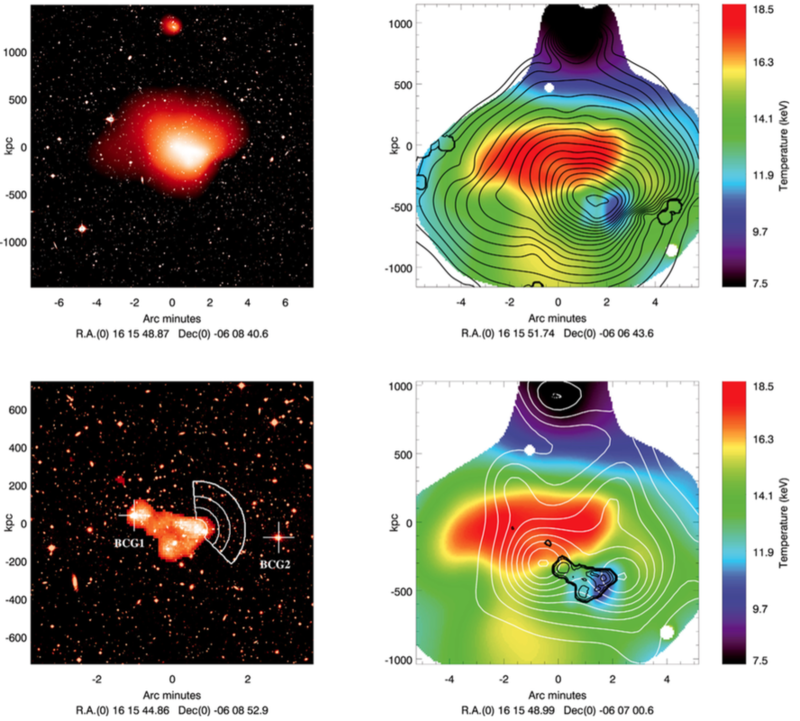 ChandraTemperature Maps for Galaxy Clusters with Radio Halos. 605(2), pp.695–708. Feretti, L. et al., 2004. Spectral index maps of the radio halos in Abell 665 and Abell 2163. Astronomy and Astrophysics, 423(1), pp.111–119. Rephaeli, Y., Gruber, D. & Arieli, Y., 2006. Long RXTE Observations of A2163. Astrophysical Journal, 649(2), pp.673–677. Maurogordato, S. et al., 2008. A 2163: Merger events in the hottest Abell galaxy cluster. Astronomy and Astrophysics, 481(3), pp.593–613. Nord, M. et al., 2009. 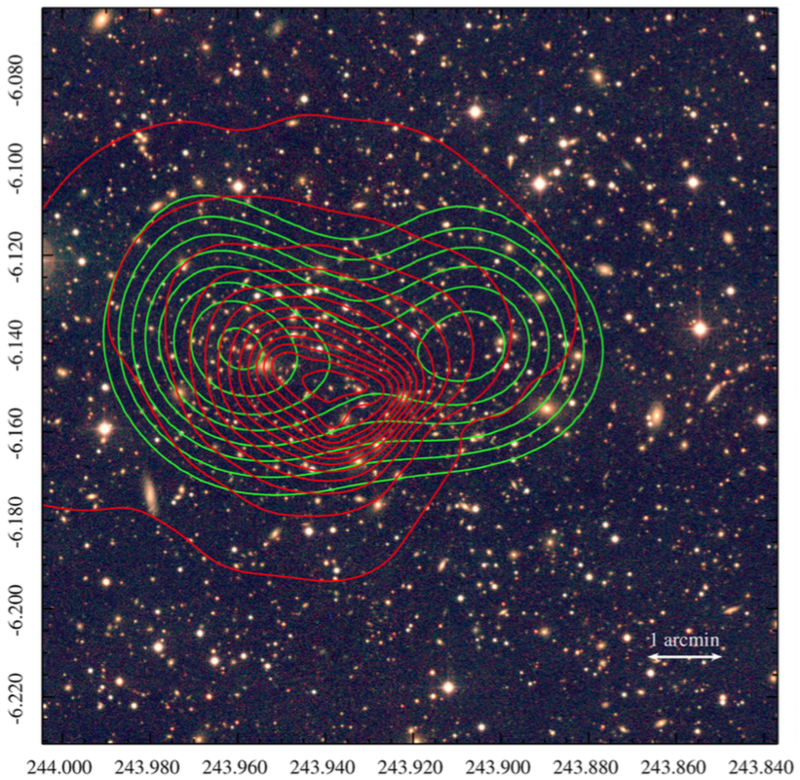 Multi-frequency imaging of the galaxy cluster Abell 2163 using the Sunyaev-Zel'dovich effect. Astronomy and Astrophysics, 506(2), pp.623–636. Bourdin, H. et al., 2011. 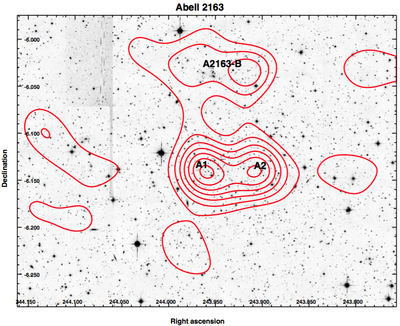 A2163: Merger events in the hottest Abell galaxy cluster. Astronomy and Astrophysics, 527, p.A21. Okabe, N. et al., 2011. Subaru Weak-lensing Study of A2163: Bimodal Mass Structure. Astrophysical Journal, 741(2), p.116. Soucail, G., 2012. 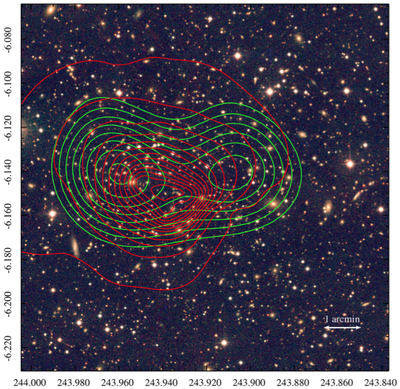 Dark matter distribution in the merging cluster Abell 2163. Astronomy and Astrophysics, 540, p.61. Ota, N. et al., 2014. Investigating the hard X-ray emission from the hottest Abell cluster A2163 with Suzaku. Astronomy and Astrophysics, 562, p.60.